Chrome is already the No. 1 free app in the Apple App Store even though it has only been a few days since Google announced its browser is now available for the iPhone and iPad. It's getting decent reviews from users who so far have cumulatively ranked it at 4.5 stars, although the biggest complaint they seem to have is the browser is slow compared with Apple's Safari. 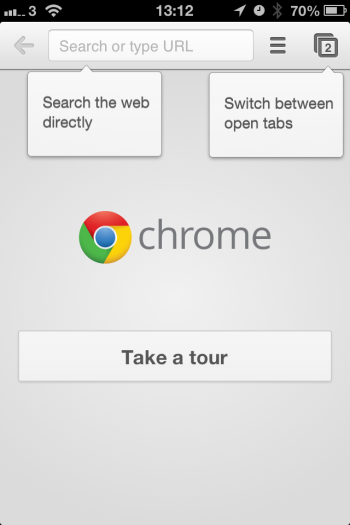 Even so, he says Chrome on iOS is only slightly slower than Safari and "until iOS 6 arrives with its tabs cloud sync solution, Chrome is your best bet to get your tabs synced across devices for mobile browsing sanity." Indeed, Google's ability to sync your tabs, bookmarks, history, settings and passwords across your computers and devices is slick. The company showed off how it works at its developer conference that just wrapped up in San Francisco this week. In a demo on Thursday, Google VP Brian Rakowski moved from various computers and devices and showed how regardless of which one he was using, whatever he did on one was instantly available on the others. Even the "back" command works, so you can get back to sites you visited at an earlier point in time even if it was on a different device or computer. Moving from a Mac where he simulated being at home reading the news with several tabs open, to a Chromebook that he might use at work, Rakowski showed that even on a computer he’d never used before he could just sign into Google and personalized work tabs he set up were instantly there if he wanted them, eliciting cheers and applause from developers. He also showed that with Chrome on his phone he could open a new tab and see all of the recent devices that had used the browser, including the Chromebook in the work simulation. In one tap on his phone he accessed a site he visited on the Chromebook. Check it out for yourself in this video that includes the demo.